Since 1972, the Little Traverse Conservancy has worked with landowners to protect the natural diversity and beauty of Northern Michigan. The conservancy protects significant land and scenic areas and provides opportunities for all of us to appreciate and understand the environment. With more than 40,000 acres of land and 70 miles of shoreline protected, the Conservancy encourages the use of the preserves for hiking, photography, and other types of recreation. When visiting the preserves, please do not remove any plant, animal or other natural features. State law requires pets to be on a leash at all times. Interpretative information is available at some of the properties and all of the sites listed here include trails or boardwalks to facilitate comfortable travel. Listed here are some of the area nature preserves. And if you're a geocacher, there are more than 80 caches hidden in 45 Conservancy preserves. Goodhart Farms Nature Preserve This site, located on Robinson Road, just off State Road north of Harbor Springs, has 625 acres and includes hiking trails. Allan and Virginia McCune Nature Preserve Here you'll find 168 acres and 3,400 feet along the Minnehaha Creek with three easy hiking trails totaling approximately three miles. 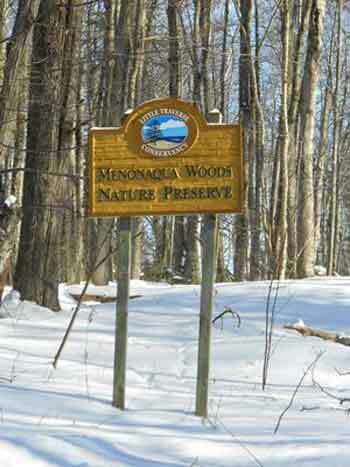 The preserve is located seven miles east of Petoskey on Maxwell Road just off of Mitchell Road. North Point Nature Preserve With 2,800 feet of Lake Michigan frontage and 28 acres, this preserve includes a variety of trails with some connecting to nearby Mt. McSauba recreation area. It is located on the north end of Charlevoix: take Mercer Road north to Pleasant Street and turn left onto Mt. McSauba Road, turn right before the dirt road as the preserve is on the left. Oden Island Nature Preserve This site has 50 acres with an easy one mile trail and benches. Take US 31 north to Pickeral Lake Road, turn right and continue onto Channel Road. Turn left on Oden Island Road and once on the island, turn right on Leeward Drive. Where Leeward meets a Y, take a sharp left and follow the two-track to the right. 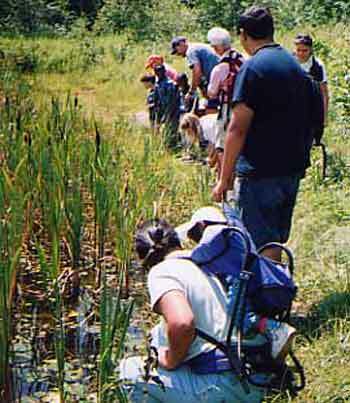 Offield Nature Preserve Hikers and snowshoe enthusiasts love the 3.7 miles of trails on 390 acres. With parking lots on Quick Road and Bester Road, this preserve offers flat or hilly terrain. Raven Ridge Nature Preserve More than 1-1/2 miles of trails and a valley overlook can be found in this 140-acre preserve. From Boyne Falls, go west of M-75 then left on M-48, left on Pearsall Road, left on Fuller Road, go over Deer Creek and up the big hill. Park at Raven Hill Discovery Center or further up the hill at the parking area. Stutsmanville Bog Nature Preserve This is a great place to see the beauty of a bog. The preserve has 65 acres with a 1/4 mile trail to the bog overlook. From Harbor Springs, take State Road north approximately five miles. Look for the preserve sign on the right side of the road. Thorne Swift Nature Preserve This gem has 30 acres and 300 feet on Lake Michigan. It includes a nature center, beach access, dune observation platform, pond observation platform, gazebo, amphitheater, and seasonal guided programs. Thorne Swift has three boardwalk trails with a total of 1-1/2 miles of easy hiking. Take M-119 north of Harbor Springs approximately four miles to Lower Shore Drive. Follow Lower Shore for 1/2 mile. There is a $3 parking fee for non-township residents. Kayaking Up North Is The Best! Up North Outdoor Activities--Hiking, Biking, Golfing, Boating, Sailing, Skiing--It's All Here!